How do stars form? Images of the star forming region W5 like those in the infrared by NASA's Wide Field Infrared Survey Explorer (WISE) satellite provide clear clues with indications that massive stars near the center of empty cavities are older than stars near the edges. A likely reason for this is that the older stars in the center are actually triggering the formation of the younger edge stars. The triggered star formation occurs when hot outflowing gas compresses cooler gas into knots dense enough to gravitationally contract into stars. In the featured scientifically-colored infrared image, spectacular pillars, left slowly evaporating from the hot outflowing gas, provide further visual clues. W5 is also known as IC 1848, and together with IC 1805 form a complex region of star formation popularly dubbed the Heart and Soul Nebulas. 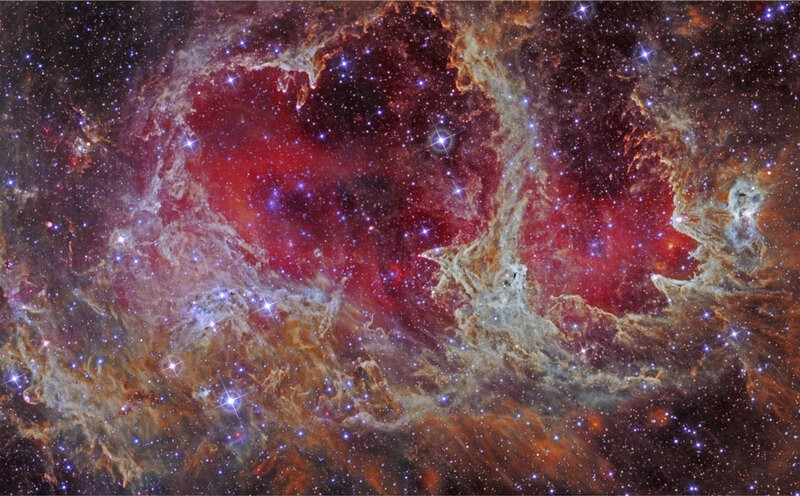 The above image highlights a part of W5 spanning about 2,000 light years that is rich in star forming pillars. W5 lies about 6,500 light years away toward the constellation of Cassiopeia. A new desk-sized rover has begun exploring the Moon. Launched two weeks ago by the Chinese National Space Administration, the Chang'e 3 spacecraft landed on the Moon yesterday and deployed the robotic rover. Yutu, named for a folklore lunar Jade Rabbit, has a scheduled three-month mission to explore several kilometers inside the Sinus Iridum (Latin for "Bay of Rainbows") impact crater. 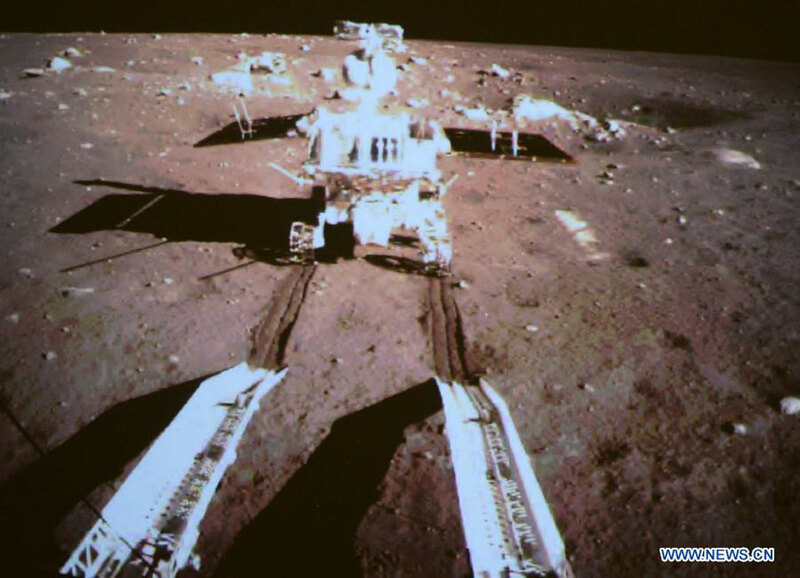 Yutu's cameras and spectrometers will investigate surface features and composition while ground penetrating radar will investigate deep soil structure. Chang'e 3 achieved the first soft Moon landing since the Soviet Union's Luna 24 in 1976, and Yutu is the first lunar rover deployed since the USSR's Lunokhod 2 in 1973. Pictured above, Yutu was imaged from its lander yesterday soon after rolling onto the Moon. What could cause a nebula to appear square? No one is quite sure. 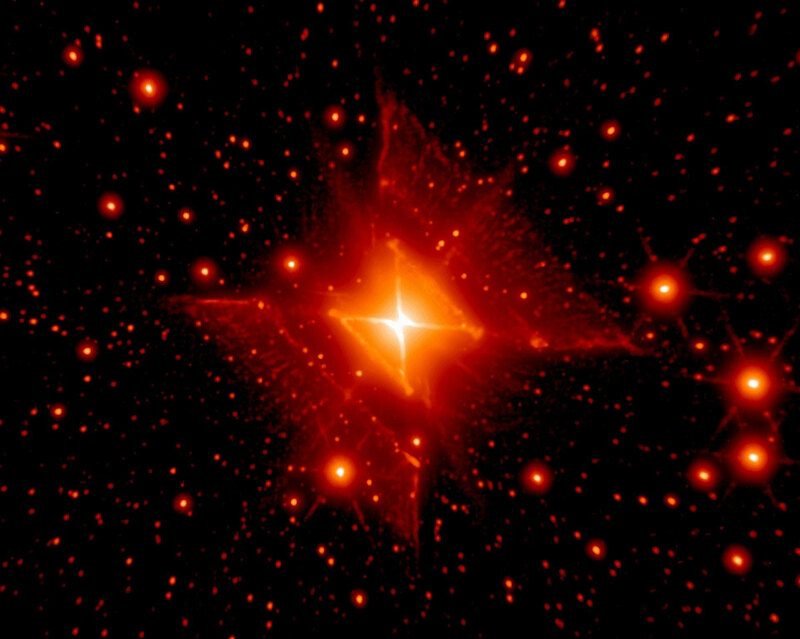 The hot star system known as MWC 922, however, appears to be embedded in a nebula with just such a shape. The above image combines infrared exposures from the Hale Telescope on Mt. Palomar in California, and the Keck-2 Telescope on Mauna Kea in Hawaii. A leading progenitor hypothesis for the square nebula is that the central star or stars somehow expelled cones of gas during a late developmental stage. For MWC 922, these cones happen to incorporate nearly right angles and be visible from the sides. Supporting evidence for the cone hypothesis includes radial spokes in the image that might run along the cone walls. Researchers speculate that the cones viewed from another angle would appear similar to the gigantic rings of supernova 1987A, possibly indicating that a star in MWC 922 might one day itself explode in a similar supernova. This surreal, wintry scene is a composite picture recorded on December 10 as the Moon rose behind the Zagros Mountains of Iran. A total lunar eclipse was already in progress. 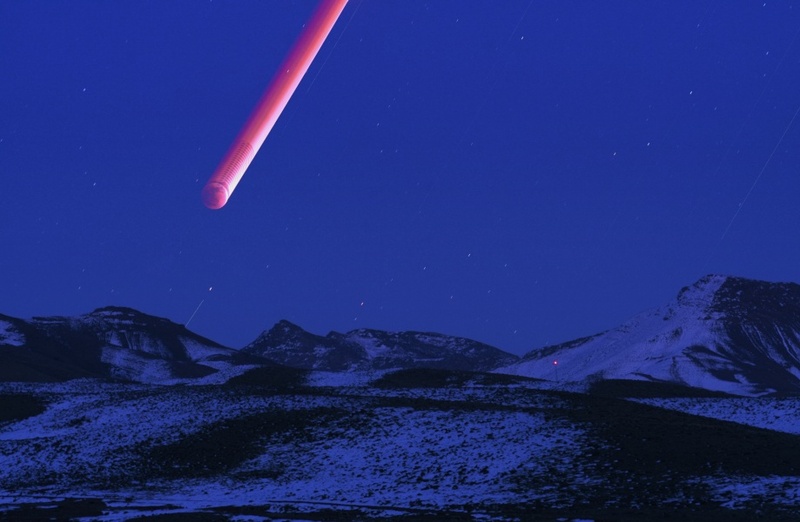 The image combines nearly 500 successive frames taken over 1.5 hours beginning in twilight as the eclipsed Moon steadily climbed above the rugged landscape. The reddened lunar disk and deep blue twilight make for a striking contrast, yet the contrasting colors have the same root cause. The eclipsed Moon is red because the Earth's umbral shadow is suffused with a faint red light. The ruddy illumination is from all the reddened sunsets and sunrises, as seen from a lunar perspective. But the sunsets and sunrises are reddened because the Earth's atmosphere scatters blue light more strongly than red, creating the twilight sky's dim, blue glow. Two large telescope domes stand in the foreground of this night sky view from Kitt Peak National Observatory, near Tucson, Arizona, USA. The dramatic scene was recorded early Tuesday morning, near the peak of December's Geminid Meteor Shower. With dome slit open, the building closest to the camera houses the 2.3 Meter (90 inch) Bok Telescope operated by Steward Observatory, University of Arizona. Behind the Bok is the Mayall 4 Meter telescope dome. Of course, no telescopes were needed to enjoy the meteors streaking through the sky! The composite image consists of 13 exposures each 15 seconds long, taken with a wide angle lens over a period of about 2 hours during Kitt Peak's warm, clear, night. An annual celestial event, this meteor shower is the result of planet Earth plowing through dust from mysterious, asteroid-like object 3200 Phaethon. 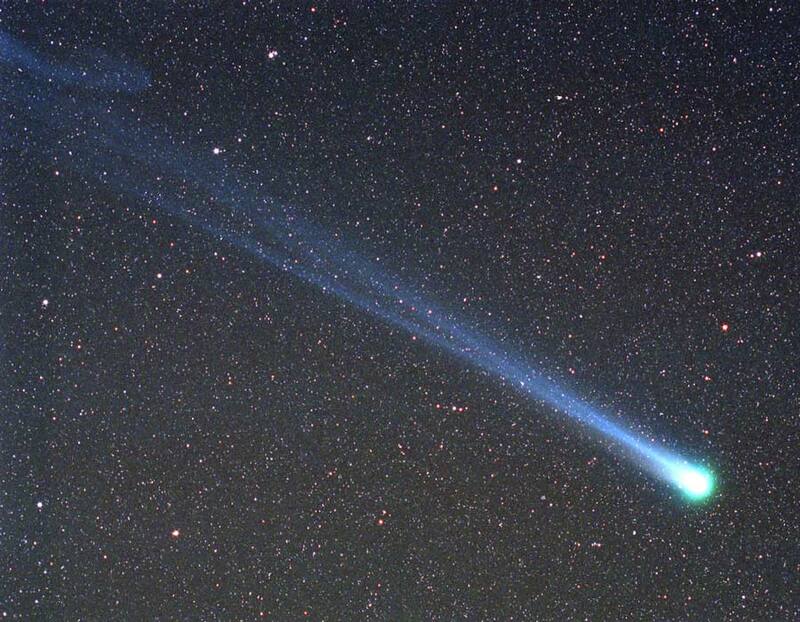 In 1996, an unexpectedly bright comet passed by planet Earth. Discovered less than two months before, Comet C/1996 B2 Hyakutake came within only 1/10th of the Earth-Sun distance from the Earth in late March. At that time, Comet Hyakutake, dubbed the Great Comet of 1996, became the brightest comet to grace the skies of Earth in 20 years. During its previous visit, Comet Hyakutake may well have been seen by the stone age Magdalenian culture, who 17,000 years ago were possibly among the first humans to live in tents as well as caves. Pictured above near closest approach as it appeared on 1996 March 26, the long ion and dust tails of Comet Hyakutake are visible flowing off to the left in front of a distant star field that includes both the Big and Little Dippers. On the far left, the blue ion tail appears to have recently undergone a magnetic disconnection event. On the far right, the comet's green-tinted coma obscures a dense nucleus of melting dirty ice estimated to be about 5 kilometers across. A few months later, Comet Hyakutake began its long trek back to the outer Solar System. Because of being gravitationally deflected by massive planets, Comet Hyakutake is not expected back for about 100,000 years. What's that in front of Orion? 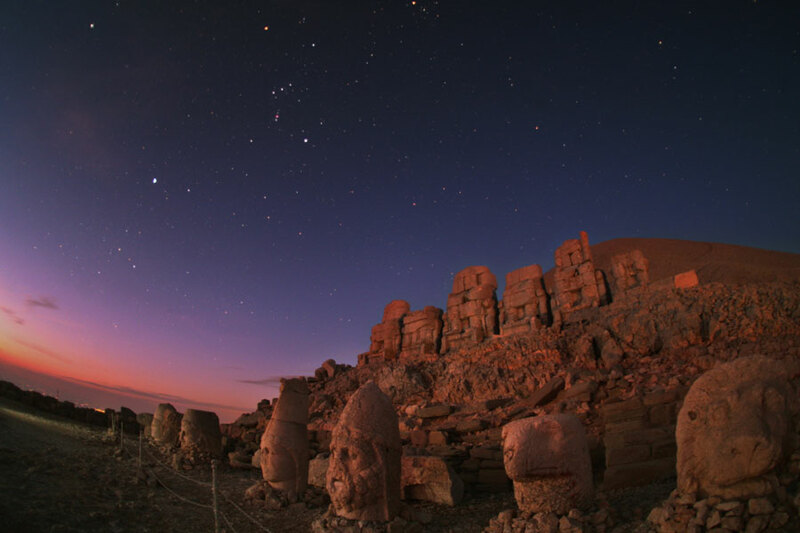 Forty kilometers north of Kahta, Turkey, lies Mount Nemrut, a mountain adorned with the fragments of vast statues built over 2000 years ago. The stone sculptures once stood nearly 10 meters high and depicted lions, eagles, various ancient gods, and King Antiochus I Theos, who ruled Commagene from 86 BC to 38 BC. Ruins of the bodies of several sitting figures are visible on the hill above, illuminated by moonlight. Zeus' head can be found near the above image's center, while the king's head is seen next closest to the horizon. Visible far in the distance in this image, taken three months ago, is the familiar constellation of Orion. The red patch just below Orion's belt is the Orion Nebula, while the bright star to the left of Orion is Sirius. On the far left, a red and brightening horizon announces that the Sun is beginning to rise. Is this picture worth a thousand words? According to the Holographic Principle, the most information you can get from this image is about 3 x 1065 bits for a normal sized computer monitor. The Holographic Principle, yet unproven, states that there is a maximum amount of information content held by regions adjacent to any surface. Therefore, counter-intuitively, the information content inside a room depends not on the volume of the room but on the area of the bounding walls. The principle derives from the idea that the Planck length, the length scale where quantum mechanics begins to dominate classical gravity, is one side of an area that can hold only about one bit of information. The limit was first postulated by physicist Gerard 't Hooft in 1993. It can arise from generalizations from seemingly distant speculation that the information held by a black hole is determined not by its enclosed volume but by the surface area of its event horizon. The term "holographic" arises from a hologram analogy where three-dimension images are created by projecting light though a flat screen. 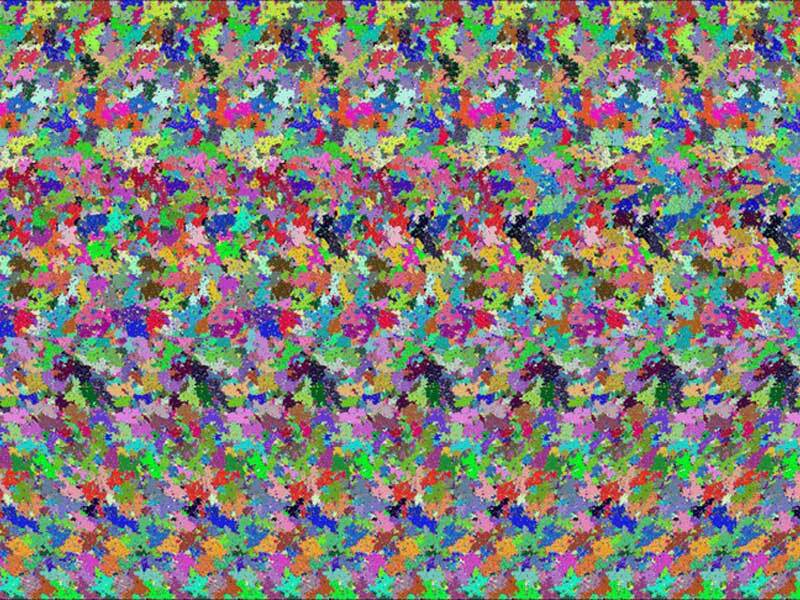 Beware, other people looking at the above image may not claim to see 3 x 1065 bits -- they might claim to see a teapot. Last Saturday, the Space Shuttle Discovery lit up the night as it climbed into orbit above planet Earth. 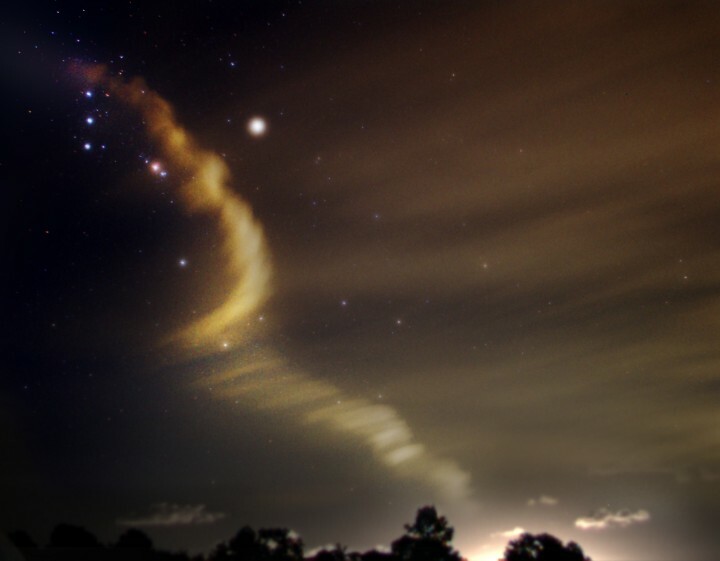 From Oak Hill, Florida, USA - about 30 miles north of the Kennedy Space Center - design engineer Andrew Arigema tracked the shuttle and recorded a four minute time exposure of the exhaust plume along Discovery's path against the background of the starry sky. At the upper left, the end of the drifting plume is punctuated by Alnitak, Alnilam, and Mintaka in a vertical line, the belt stars of Orion. To the right of the belt stars, the pinkish jewel in Orion's sword is not a star at all, but the great Orion Nebula. Still farther to the right, at the foot of the hunter, lies Rigel, the brightest star in view. Rigel is a hot supergiant star some 700 light-years in the distance. Scroll right and gaze through the dusty plane of our Milky Way Galaxy in infrared light. The cosmic panorama is courtesy of the Galactic Legacy Infrared Mid-Plane Survey Extraordinaire (GLIMPSE) project and the Spitzer Space Telescope. The galactic plane itself runs through the middle of the false-color view that spans nine degrees (about 18 full moons) across the southern constellation Norma. Spitzer's infrared cameras see through much of the galaxy's obscuring dust revealing many new star clusters as well as star forming regions (bright white splotches) and hot interstellar hydrogen gas (greenish wisps). The pervasive red clouds are emission from dust and organic molecules, pocked with holes and bubbles blown by energetic outflows from massive stars. Intensely dark patches are regions of dust too dense for even Spitzer's infrared vision to penetrate. The grand, winding arms are almost mesmerizing in this face-on view of NGC 7424, a spiral galaxy with a prominent central bar. About 40 million light-years distant in the headlong constellation Grus, this island universe is also about 100,000 light-years across making it remarkably similar to our own Milky Way. Following along the winding arms, many bright bluish clusters of massive young stars can be found. The star clusters themselves are several hundred light-years in diameter. And while massive stars are born in the arms of NGC 7424, they also die there. 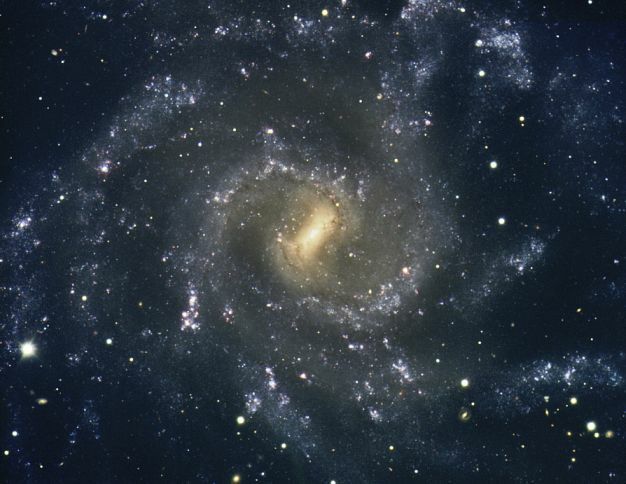 Notably, this galaxy was home to a powerful stellar explosion, supernova SN 2001ig, which faded before this deep European Southern Observatory image was recorded. Why would Mars appear to move backwards? Most of the time, the apparent motion of Mars in Earth's sky is in one direction, slow but steady in front of the far distant stars. About every two years, however, the Earth passes Mars as they orbit around the Sun. During the most recent such pass in August, Mars loomed particularly large and bright. Also during this time, Mars appeared to move backwards in the sky, a phenomenon called retrograde motion. Pictured above is a series of images digitally stacked so that all of the stars images coincide. 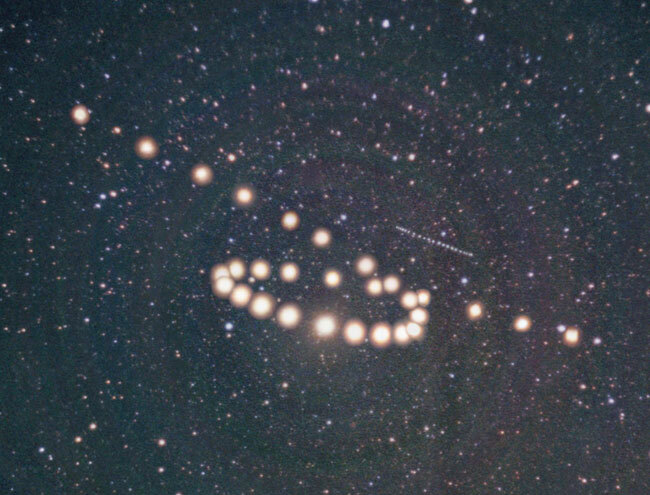 Here, Mars appears to trace out a loop in the sky. At the top of the loop, Earth passed Mars and the retrograde motion was the highest. Retrograde motion can also be seen for other Solar System planets. In fact, by coincidence, the dotted line to the right of the image center is Uranus doing the same thing. What types of terrain are found on Mars? Part of the answer comes from thermal imaging by the robot spacecraft 2001 Mars Odyssey currently orbiting Mars. The above picture is a superposition of two infrared images, a black and white image taken during Martian daylight and a false-color image taken at night. For the daytime image, dark colors mean cool temperatures, dropping from about -5 degrees Celsius to low as -35 degrees Celsius. Shadowed regions appear particularly dark, while grooved structure on the floor of Melas Chasma indicates successively overlapping landslides. In the nighttime swath, blue areas have cooled relatively quickly, indicating a composition of fine-grained dust and sand. One of the most identifiable nebulae in the sky, the Horsehead Nebula in Orion, is part of a large, dark, molecular cloud. Also known as Barnard 33, the unusual shape was first discovered on a photographic plate in the late 1800s. The red glow originates from hydrogen gas predominantly behind the nebula, ionized by the nearby bright star Sigma Orionis. The darkness of the Horsehead is caused mostly by thick dust, although the lower part of the Horsehead's neck casts a shadow to the left. Streams of gas leaving the nebula are funneled by a strong magnetic field. Bright spots in the Horsehead Nebula's base are young stars just in the process of forming. 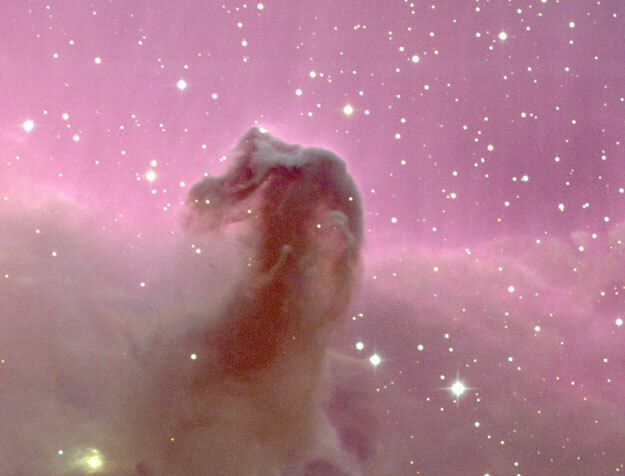 Light takes about 1500 years to reach us from the Horsehead Nebula. 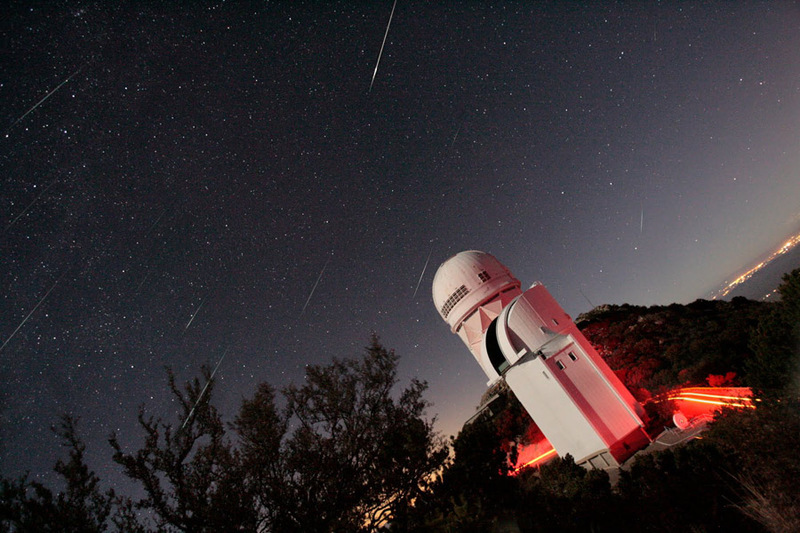 The above image was taken with the 0.9-meter telescope at Kitt Peak National Observatory. Like the Earth's Moon, Mercury is scarred with craters testifying to an intense bombardment during the early history of the Solar System. In 1974, the Mariner 10 spacecraft surveyed this innermost planet up close, producing the only detailed images of its tortured surface. In the above mosaic the bright rays emanating from the 45 kilometer wide Degas crater almost appear to be painted on. The rays consist of light colored material blasted out during the crater's formation. Craters older than Degas are covered by the ray material while younger craters are seen superimposed on the rays. 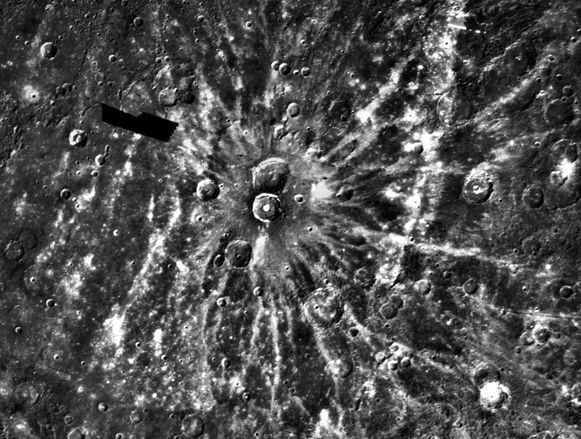 Mercury's gravity and density are about twice that of Earth's Moon so such bright ray craters on the lunar surface tend to be much larger. NASA plans to launch MESSENGER to the least explored terrestrial planet in 2004.
Credit: A. Pedlar and T. Muxlow (Jodrell Bank,Univ. Manchester), K. A. Wills (Univ. Sheffield), et al. 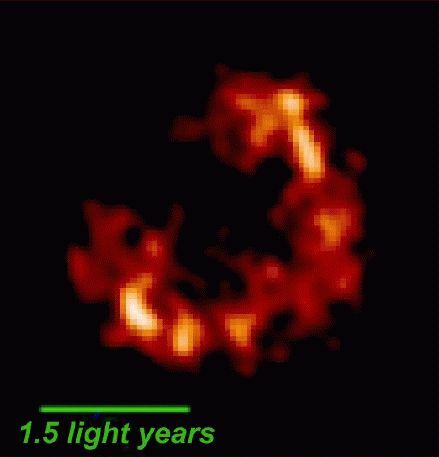 This false-color radio wavelength picture of an expanding stellar debris cloud is the product of one of the largest radio astronomy experiments ever. Combining the output of 20 radio telescopes scattered around planet Earth, astronomers have produced this amazingly detailed image of a supernova remnant just over 1.5 light-years across in M82, an intense star forming galaxy 12 million light-years away. The radio astronomy technique for creating the earth-sized array of telescopes is known as VLBI (very long baseline interferometry). The individual telescopes of the array are too far apart for all their signals to be combined in "real time", so their output was recorded on magnetic tapes which were brought to a single location and correlated. This technique has produced the highest resolution astronomical observations currently possible and allows the exploration of such distant, violent galactic environments in unprecedented detail. 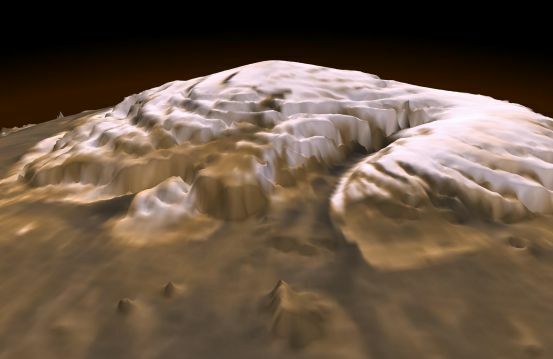 This dramatic premier three-dimensional visualization of Mars' north pole is based on elevation measurements made by an orbiting laser. During the Spring and Summer of 1998 the Mars Orbiter Laser Altimeter (MOLA) flashed laser pulses toward the Martian surface from the Global Surveyor spacecraft and recorded the time it took to detect the reflection. 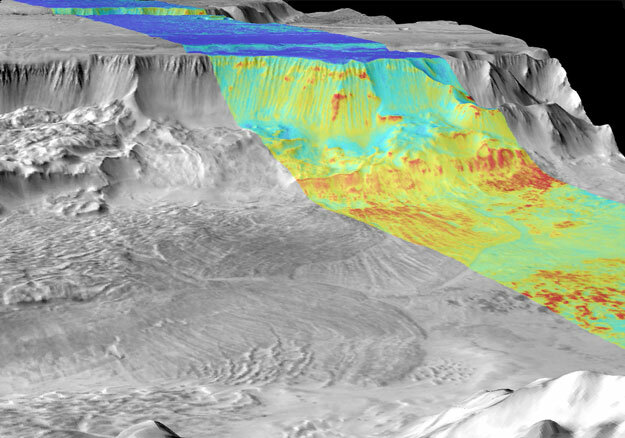 This timing data has now been translated to a detailed topographic map of Mars' north polar terrain. The map indicates that the ice cap is is about 1,200 kilometers across, a maximum of 3 kilometers thick, and cut by canyons and troughs up to 1 kilometer deep. The measurements also indicate that the cap is composed primarily of water ice with a total volume of only about four percent of planet Earth's Antarctic ice sheet. In all it represents at most a tenth of the amount of water some scientists believe once existed on ancient Mars. Where did all the water go? 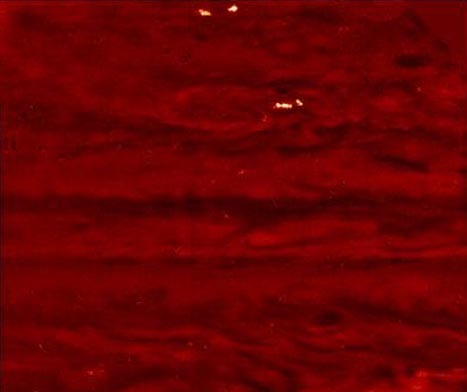 Why is there lightning on Jupiter? Lightning is a sudden rush of electrically charged particles from one location to another. To create lightning, charges must first separate inside a cloud. On Earth, drafts of colliding ice and water droplets usually create this charge separation, but what happens on Jupiter? Many astronomers theorize that Jovian lightning is also created in clouds containing water ice. To help investigate this, the above photograph was taken in October by the Galileo spacecraft now orbiting Jupiter. Clouds are dimly lit by sunlight reflected off Jupiter's moon Io. The bright flashes appear to originate in active regions at the level where water clouds would exist, and illuminate an even lower cloud level containing ammonia. One thing is for sure: lightning on Jupiter is a lot brighter than lighting on Earth. Old photographs show no evidence of the above nebula. In 1992, a white dwarf star in Cygnus blew off its outer layers in a classical nova explosion: an event called Nova Cygni 1992. Light flooded the local interstellar neighborhood, illuminated this existing gas cloud, excited the existing hydrogen, and hence caused the red emission. The only gas actually expelled by the nova can be seen as a small red ball just above the photograph's center. Eventually, light from the nova shell will fade, and this nebula will again become invisible! Aloha! With the graceful arc of the Earth's limb in the background, the entire Hawaiian Island archipelago is visible in this stunning photo taken by the astronauts onboard the shuttle Discovery in October of 1988. Along with popular beaches and tropical resorts, these volcanic islands offer extreme elevations with dark, dry, cloudless skies. Consequently they have also become popular sites for sophisticated ground based telescopes. The peak of Mauna Kea, on the Big Island (upper left), boasts an impressive array of astronomical instruments including the Keck Telescope, the Canada-France-Hawaii Telescope, the NASA IRTF, the JCMT and UKIRT, and the Gemini Telescope Project. The dormant volcanic cone of Haleakala on Maui (just below the Big Island) is home to the Air Force Maui Optical Station and the Mees Solar Observatory. Mahalo nui loa!